Oil & Butter: Got your sunglasses on?! In the morning, this is what a found! 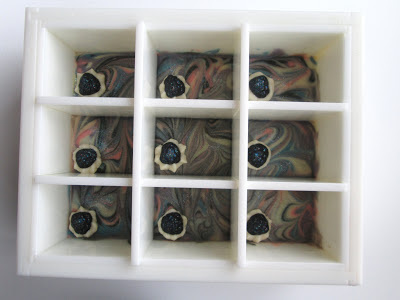 NEON soap! Ack! 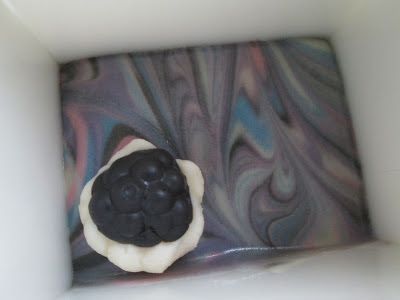 It must be from the fragrance oil (Black Raspberry Vanilla), but there is no milk or any weird ingredients that would react to cause the discoloration. I bet I couldn't replicate these colors again if I tried! Ah, yes, the Black Raspberry Vanilla with a yellow surprise....it's happened to me, too. Yours is striking, though--I like the delicate swirls! And the little black raspberry in the corner is the perfect finishing touch. I'm afraid the yellow stuck around, but it did fade slightly. At least yellow is better than that dark brown with most vanillas! Well, that's good to know about the yellow...and you're right, dark brown would have swallowed up those swirls for sure! 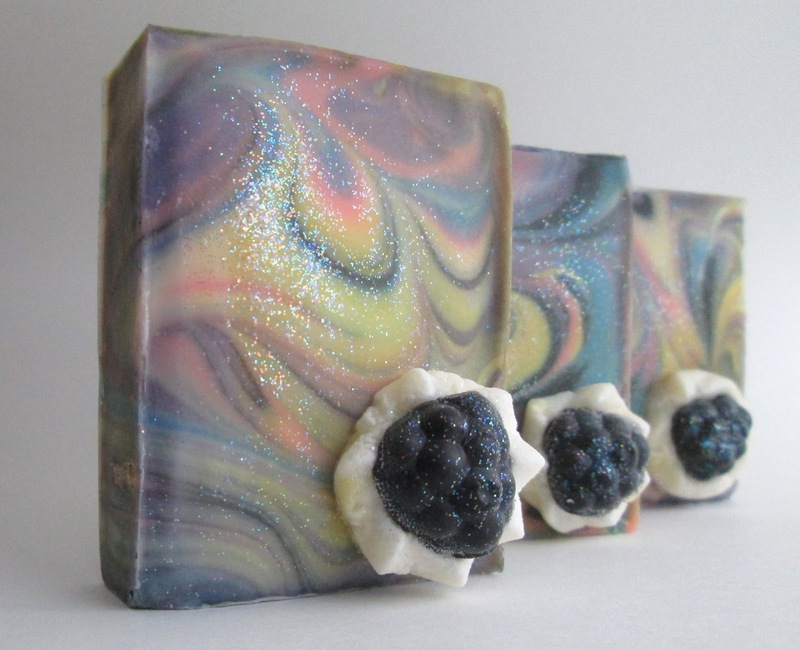 Maybe you should call it Black Raspberry Vanilla Sunshine? That has happened to me with that fragrance oil as well Cee Gee! It still looks great though! I love your soaps! Still a very pretty soap Cee! I have this fragrance but haven't tried it yet....so glad you posted this! Thanks Gloria...it will be interesting to see how yours behaves. I might try BRV from another company next time to see if it behaves better. Thanks Chrissy, you make it sound so poetic and lovely...lol! Es lo que tiene, que cuando hacemos jabón no sabemos muy bien los colores finales que van a quedar. It looks perfectly pop, not retro at all! Thanks Kia, it's so good to know I'm not alone. Thank you for the nice compliment! I've had this happen before too...with a fragrance that I never have problems with. I had thought maybe I didn't mix well, so I threw the batch out! The neon yellow was startling, lol. Your soap still turned out pretty! Weird, hey? The supplier that I bought it from says it doesn't discolor, but I beg to differ...ha ha! 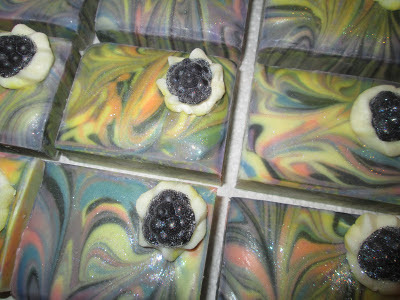 I find it is a beautiful soap even with the yellow, Cee!The swirls are pretty!It still looks great! The soap is still gorgeous, Cee Gee! I don't think that the yellow diminishes its beauty at all. The swirls are so pretty, and I love the little raspberries. The soap turned out gorgeous no matter that it’s maybe not in line with your expectations. For me this soap design is about small details which are really outstanding. Grate job Cee! Thank you so much Gordana, I really appreciate your kind comments and support!